When? Sunday, September 9 – Tuesday, September 11 (2 nights). We did a lot in these two days, but, as always (it seems) I wish we had been able to stay longer. We really enjoyed the tapas scene in Sevilla and another night would have meant two more meals! We were in Sevilla on a Sunday and Monday night, and found out that the bullfights were on Thursdays, although they used to be on Sundays. We considered going to a bullfight, but after reading that they are so gory and violent that many Americans have got up and left, we decided against it. However, we went to the bullfighting arena for a tour and we now have an understanding of what takes place during a bullfight, and we plan to attend one the next time in Spain! This means we will have to be sure to be in Sevilla (if that’s where we will attend one) on a day that actually has a fight. Where? We stayed at the Hotel Amadeus and thought it was great. We were originally thinking of staying at the Hotel Casa 1800 (I wrote a bit about it here), but it was all booked by the time we made the decision. Both hotels have a great location! A few great things about Hotel Amadeus include the amazing rooftop terrace with a bar, several common areas to relax, an amazing breakfast, and very friendly staff (with a 24-hour reception). The one thing I would definitely do differently is stay in a smaller and cheaper room. We paid for the Junior Suite, but there was no view or balcony, and we were up on the rooftop terrace when we had free time at the hotel. Transportation. We took the train into and out of Sevilla. The train station was super close, so the taxi ride was quick and cheap. We did not have to deal with any long lines or confusion on our way to Granada. Food. Amazing! We absolutely loved the tapas scene in Sevilla. There was a particular street with restaurants on both sides and it was absolutely packed both nights we were there (we got there around 11pm or so each night). The street is one that leads into the plaza with the cathedral and was very walkable from our hotel. Most of the restaurants had tables that spilled onto the sidewalk, making the area feel very busy and lively. We did decide to splurge on our second lunch in Sevilla and ate at Abades Triana, which is located across the river. 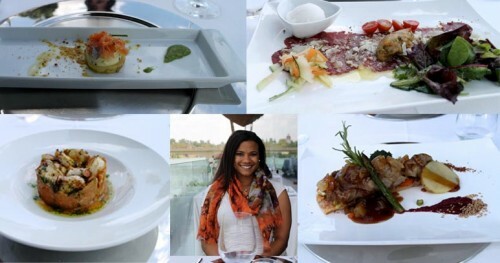 The food was delicious (and expensive) and we enjoyed it outside on the shady terrace overlooking the river. We shared the ox carpaccio with pumpkin guacamole, I had the octopus and potato, and Ryan had the Iberian pork tender loin with grilled veggies and caramelized apples. We were surprised by a small aperitif with potato, truffle potato mousse, smoked salmon, and a basil sauce on the side. It was tiny, but a great start to our fantastic meal. Attractions. Honestly, I didn’t know much about Sevilla before we got there (Ryan did a lot of the research here) and I wasn’t expecting much. I was wrong! We were so impressed with the Cathedral, the Alcázar, and the bullfighting arena tour. The Cathedral was huge (I believe it is the third largest in Europe, after St. Paul’s and St. Peter’s) and I really enjoyed the Treasury, which was tucked away in several rooms and contained gorgeous jewels. The Alcázar, built as a palace in Moorish times, was impressive with its intricate designs and vast gardens. We easily spent over two hours there and could have stayed longer. Finally, I am so glad we decided to take a guided tour of the bullfighting arena and museum. We learned a lot more about bullfights and we now want to attend one. And finally, the most famous thing to do while in Sevilla is to see a Flamenco show. We decided to go with a show without dinner, since we had read that the food can be mediocre at the joint restaurant/Flamenco options. The show we saw was an hour long, and while we thought it was interesting, we didn’t enjoy it as much as we thought we would. I’ll save a full review for a different post. Language Barrier. English is definitely spoken here, but I took advantage and tried to speak Spanish when I could. Luckily my broken Spanish was readily accepted and I was able to communicate in Spanish on several occasions. Cost. Overall, Sevilla was fairly inexpensive. Our hotel room was not cheap (175 euros/night), but we could have gotten away with less, even at that same hotel (the standard double would have been closer to 100 euros). The food was also very reasonable – there are expensive restaurants, but the tapas scene allowed us to eat a variety of foods cheaply. We walked everywhere, so we didn’t have the need to take public transportation, which was nice after our expensive taxi rides in Barcelona. Advice. 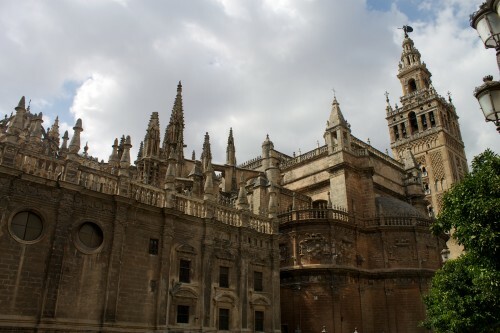 Try to stay in the Santa Cruz area, since it is close some of the most interesting parts of Sevilla. If you want to see a bullfight, make sure you plan your itinerary so that you are actually in Sevilla on the day of the fight (this is obvious, but I’m not sure how consistent the days of bullfights are). Closing comments. We had such a great time in Sevilla and it was actually awarded the title of our favorite stop in Spain! The culture felt real, the food was delicious, and unbeknownst to me, there was so much to do. This entry was posted in City Overview, Travel and tagged Portugal/Spain 2012 Trip, Sevilla, Spain by Kristin. Bookmark the permalink.